It wasn't more than a few hours after I posted my last blog that Jessica began the early stages of labor. Thanks God, responding to my desperate and pathetic cries for delivery (get it? ), as well as having some of Jessica's labor coincide with Pam Halpert's was pretty cool. So after 19 hours of labor we finally got to meet our little guy, Nolan, face to face. 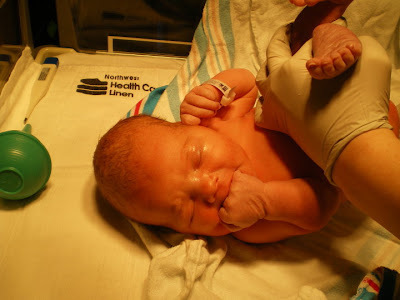 He was born on his due date, March 5, 2010. Jessica was in the zone. She decided beforehand that she wanted to go natural, and she never once hesitated on that decision all the way to the very end. She is my hero. If technology ever allows the motion picture film "Junior" to become reality, I hope I am able to give birth even half as well as my wife. Jess and I feel so blessed beyond measure to have a son as beautiful and healthy as our little Nolan. Thank you for being a part of his journey to our arms through the Creature Chronicles. If I were you I would expect more posts on Creature, who, now departed from the womb, will only be referred to as Nolan, Nolie, Nolosopher, Indie (his initials are N.D. and "Indie" flows a lot better than the mechanical En-dee), little buddy, little pal, babushka, or anything else that Jess and I haven't conceived of yet. Great photos! Nolan is a good looking baby. Gosh finally an update! Love this kid! He's amazing!! GOOD JOB GUYS!